A growing number of brides are referencing their heritage for bridal inspiration from the ancient thrones of Africa. They are taking their cues from Cleopatra, Nefertari, Makeda, and Queen Kahina of Egypt. Upholding such high expectations is challenging, yet can be found in the crafty hands of a soft-spoken dress designer working in Texas. TeKay Designs by Kimma Wreh is committed to serving brides whose dreams command that symbolism, prosperity, heritage, and culture be packaged and delivered in a collection of garments. “I’ve travelled throughout the world from Latin-America to India and in various African countries and I admire the creativity of local artists. I’ve always been inspired by the craftsmanship of local artists when traveling back to my country of Liberia. There are different variations of the ethnic design types. Traditional African consumers in countries like Ghana and Liberia prefers what’s referred to as the “buba and the lappa”. The buba is a loose fitted blouse and the lappa is a wrap-around skirt. 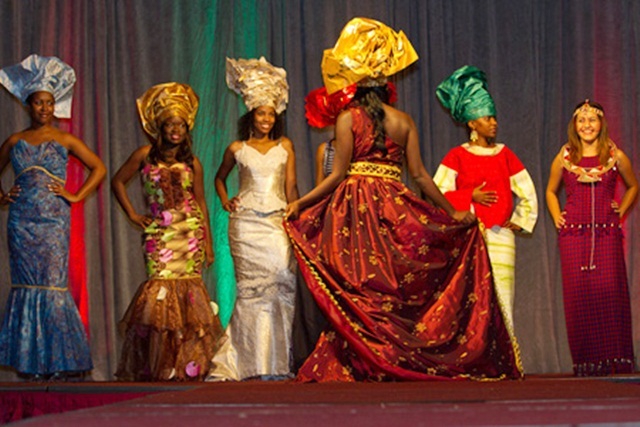 The attire is finished with a head-tie or Gele atop the crown. However, more upscale consumers are wearing high-end cotton prints. The trends out of Europe by African fashion designers is to incorporate fitted, multi-coloured cotton prints mixed with a plain coloured fabric and often finished with lace. “These western trends are now influencing the indigenous designers emerging out of Africa. The popular trends I’m seeing on the catwalks by my designer colleagues in Africa are incorporating inspired elements from other cultures. I’m seeing the use of fabrics and ornaments which are traditionally from India or Asia and even Latin-America,” Kimma told People With Voices. Consumers in the US tend to prefer a westernized fit to the garment, with an ethnic finishing to it. They like to see some cultural aspects such as the embroidery, the fabric, and the use of beads, cowrie shells and symbols which are reminiscent of their heritage. These elements bring back their culture, even though they may be wearing a design cut that’s very westernized in its material and fit. In the world of ethnic fashions, brides are investing into something more than a dress. The ethnic fashions display their identity, so this becomes a theme for the entire wedding. 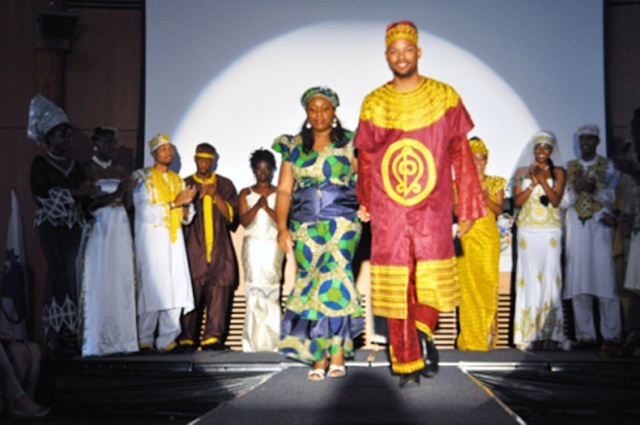 Ethnic fabrics and symbols are often used to accessorize theme weddings and leave a lasting impression. Ethnic accessories such as bouquets, headpieces or sashes are used to compliment the bridesmaids and flower girl’s attire. The groom’s outfit is usually colour- coordinated with the bride’s wedding gown. A common trend worn by groomsmen is the sleeveless agbada suit sometimes worn with a kente shoulder-wrap, hat, handkerchief or tie. “Ethnic couples are investing into something that represents their family history and will transcend through future generations. Cultural pride is a value that you can’t put a price on,” Kimma said.